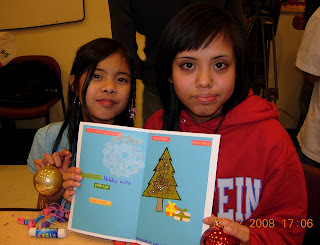 On December 12th, 2008, Maryland had its first annual Holiday Party at the Gilchrist Center for Cultural Diversity. The event was a huge success, as all who attended got a full night of food and holiday cheer. Over the course of the evening, students, volunteers, mentors and staff all came together to design Holiday cards, decorate ornaments, eat a huge meal and discuss the year that was coming to a close, as well as the one fast approaching. AALEAD would like to send a special thanks to the Asian Pacific Bar Association of DC and Marita Etcubañez for the incredible generosity and kindness they displayed by donating a book for every student who attended the MD Holiday Party. Thank you so much! 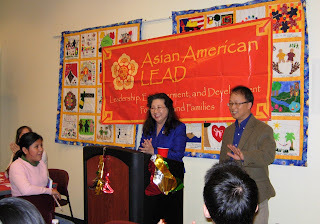 Thank you also to Delegate Susan Lee and Judge Chung K. Pak who attended our event and share their unique perspectives on the holidays and life in general with the crowd. The students responded well to everything that Delegate Lee and Judge Pak had to say and took away a lot of valuable lessons about what it takes to be successful.